All parents and teachers have one thing in common: we want our children to understand and be able to use math. Counting, multiplication, fractions, geometry — these topics are older than the pyramids. So why is mathematical mastery so elusive? The root problem is that we’re all graduates of the same system. The vast majority of us, including those with the power to shape reform, believe that if we can compute the answer, then we understand the concept; and if we can solve routine problems, then we have developed problem-solving skills. The culture we grew up in, with all of its strengths and faults, shaped our experience and understanding of math, as we in turn shape the experience of our children. …which led to the reactionary Back to Basics movement of the 1970s and 80s. In the last part of the twentieth century, Reform Math focused on problem solving, discovery learning, and student-centered methods. But Reform Math brought calculators into elementary classrooms and de-emphasized pencil-and-paper arithmetic, setting off a “Math War” with those who argued for a more traditional approach. Now, policymakers in the U.S. are debating the Common Core State Standards initiative. These guidelines attempt to blend the best parts of reform and traditional mathematics, balancing emphasis on conceptual knowledge with development of procedural fluency. The “Standards for Mathematical Practice” encourage us to make sense of math problems and persevere in solving them, to give explanations for our answers, and to listen to the reasoning of others‌—‌all of which are important aspects of mathematical understanding. But the rigid way in which the Common Core standards have been imposed and the ever-increasing emphasis on standardized tests seem likely to sabotage any hope of peace in the Math Wars. What Does It Mean to “Understand Math”? Through all the math education fads, however, one thing remains consistent: even before they reach the schoolhouse door, students are convinced that math is all about memorizing and following arbitrary rules. Understanding math, according to popular culture‌—‌according to movie actors, TV comedians, politicians pushing “accountability,” and the aunt who quizzes you on your times tables at a family gathering‌—‌means knowing which procedures to apply so you can get the correct answers. But when mathematicians talk about understanding math, they have something different in mind. To them, mathematics is all about ideas and the relationships between them, and understanding math means seeing the patterns in these relationships: how things are connected, how they work together, and how a single change can send ripples through the system. Mathematics is the science of patterns. The mathematician seeks patterns in number, in space, in science, in computers, and in imagination. Theories emerge as patterns of patterns, and significance is measured by the degree to which patterns in one area link to patterns in other areas. Click here to read Understanding Math, Part 2: What Is Your Worldview? CREDITS: “Thinking” photo (top) by Klearchos Kapoutsis via Flicker (CC BY 2.0). 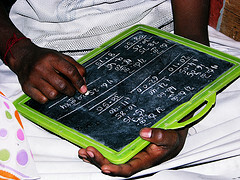 “Math on a Slate” (middle) by Pranav via Flicker (CC BY 2.0). “I Can Model Problems” poster by Nicole Ricca via Teachers Pay Teachers. “Math Homework” photo (bottom) by tracy the astonishing via Flickr (CC BY-SA 2.0). This is the first post in my Understanding Math series, adapted from my book Let’s Play Math: How Families Can Learn Math Together—and Enjoy It, available at your favorite online book dealer. There’s so much to this that relates to how we relate to children on the whole, how much we respect them or not. The person, the philosophy, if you study Montessori intensely, or hold them lightly in mind you know that is the ultimate goal. I don’t know much about Montessori, but it’s my respect for children as persons that shapes much of my approach to math. Dogs we can train to do tricks without understanding why. Computers we can program to follow rules precisely. But for rational persons, math needs to make sense.